When Ali is nineteen she begins college at St. John's and meets charismatic, attractive Will and they become inseparable. Ali is shocked when she learns that Will is the Canal Killer - having stalked and drowned five young women in the muddy waters of the Grand Canal, including Ali's best friend, Liz. Will has been sentenced to life in jail. 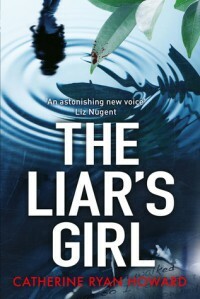 But it's been ten years and Will is locked up in the city's Central Psychiatric Hospital, so when a young woman is found in the Grand Canal the Garda detectives visit Will in hopes that he can help them solve the copycat killing. But Will won't speak. The only way he will is if Ali comes to see him. The last thing Ali wants is to leave her anonymity and the Netherlands to return to a time she's worked so hard to forget. But the right thing to do is to go back and so she does. I really had to think about what to rate this. The first chapter was great, it was strong, it pulled me in. I loved the setting. I really enjoyed the chapters about Ali's past, about the excitement about going to college with her best friend and how everything is so new to them. The characters were three-dimensional. But I felt like in the present chapters there was just a whole lot of the same thing going on which also made it feel as though a whole lot of nothing happened. Ali was brought back to Ireland to solve a case - really? The detectives are trained to do this sort of thing, that's their job and they had to bring in someone else to do it for them? It just didn't sit well with me. Thank you to Netgalley and Blackstone Publishing for an ARC.